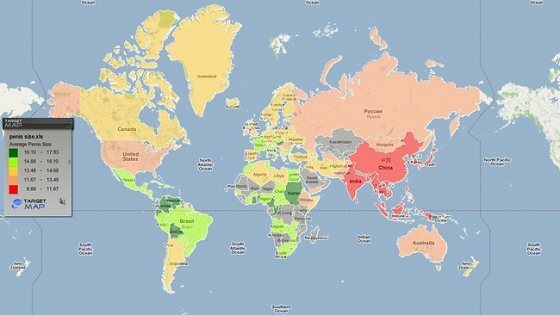 Home World WTH The P***is Survey - Which Country's Men Are The World's Most Well-Endowed? The P***is Survey - Which Country's Men Are The World's Most Well-Endowed? From time to time, we come across information on the internet that is just clearly meaningless... this is one of those times - a website known as 'everyoneweb.com' have released the findings of their latest piece of research - specifically, they have collected data on the average 'male appendage' sizes across the globe. So where does Singapore sit? Check it out for yourself here. Seems that Aussies have just scraped into the top 100 (96) with a 'measured' average length of 13.2cm. The data is a reported to be a mix of stated and undefined sources. First place winners in terms of overall size, is the Congo - an average "self-reported" p**is size of a whopping 18cm!!! The Congo is closely followed by the rest of the top 5 in the list - Ecuador sits at 17.5cm (measured), Ghana weighs in at 17.3 cm (self-reported), Colombia report an average of 17cm (measured) and finally Venezuela ranked in with 17cm (measured).